Can we use your location to show dealers in your area? Harvest by Meridian manufactures the T-series top drive augers to be durable and easy to operate. Built with the highest quality parts, the top drive grain augers are engineered using fully integrated laser technology and iron edge flighting which is up to 50% thicker at the edge than other augers. The flex hopper increases capacity up to 10% and the wheel kit allows for easy yard maneuvering. With many options to choose from, Harvest by Meridian augers will help you get the job done. Double tapered bearings at discharge handle both radial & axial loads; superior to a ball bearing. Flighting throughout entire auger: up to 50% thicker edge. Powder Coat Plus for superior coating & longer lasting. Brand new highway-rated tires & rims are standard on all of our T series models. Small-gap intake & flex-hopper grate: a safety priority without sacrificing capacity. Every service access requires a pin or bolt removal to decrease risk of accidents. All grease points are easy to access. Removable 5/16” flighting at intake, 3/16” flighting throughout remainder – 1/4” remainder on T13. T832 30’ 8” 925 lbs. T836 34’ 8” 1,000 lbs. T842 42’ 8” 1,155 lbs. T852 52’ 8” 1,400 lbs. T862 62’ 8” 1,650 lbs. T1032 30’ 10” 1,300 lbs. T1036 34’ 10” 1,400 lbs. T1036EXT 40’ 10” 1,900 lbs. T1042 42’ 10” 1,500 lbs. T1052 52’ 10” 2,020 lbs. T1062 62’ 10” 2,320 lbs. T1332 30’ 13” 1,600 lbs. T1342 42’ 13” 2,150 lbs. 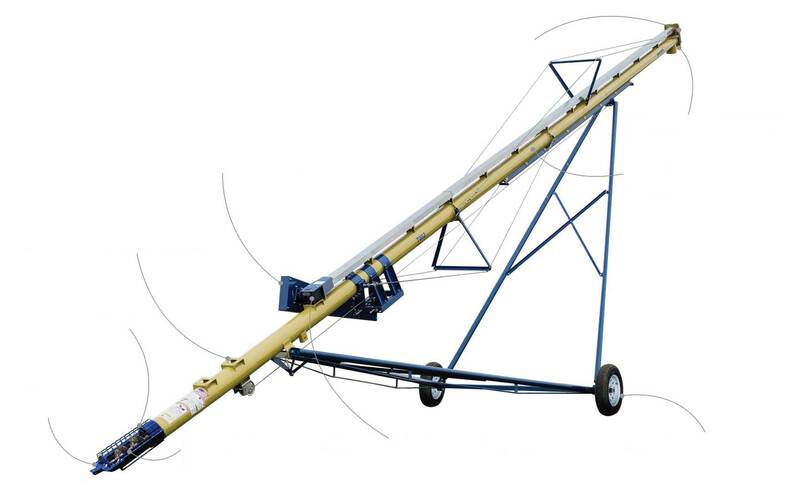 Grain augers are used to raise and transport grain from the ground to the top of grain bins or to load trucks from the grain bin. Perfect for all types of grain handling such as corn or soybeans. Excludes rice. Harvest by Meridian warrants its products for a period of one (1) year or 90 days for commercial applications from original date of purchase by the original purchaser to be free from defects in material and workmanship under correct, normal agricultural use and proper applications. Harvest by Meridian’s obligation under this warranty is limited to the repair or exchange at Harvest by Meridian’s discretion, of any Harvest by Meridian part or product which proves to be defective as provided. Harvest by Meridian reserves the right to have the product returned to a dealer of Harvest by Meridian or to our factory, with the transportation charges prepaid. This warranty does not obligate Harvest by Meridian to bear the cost of labor in replacing defective parts. Any defects must be reported to the company before the end of the one (1) year period. This warranty shall not apply to equipment which has been damaged or subject to accident, improperly assembled, or has been altered, improperly maintained or improperly repaired or repaired by anyone other than an authorized Harvest by Meridian representative. The purchaser is solely responsible for determining the suitability of the goods sold. The foregoing is in lieu of all other warranties, expressed or implied, including any warranties that extend beyond the description of the product, and the implied warranty of merchantability is expressly excluded. Harvest by Meridian will be in no event be liable for any incidental or consequential damages whatsoever. Not for any sum in excess of the price received for the goods for which liability is claimed. Harvest by Meridian makes no express warranties other than those which are specifically described. Any description of goods including any references and specifications in circulars, catalogues, and other written material published is for the sole purpose of identifying goods and shall conform to such descriptions. Any sample or modes if for illustrative purposes only and does not create an express warranty that the goods conform to sample or model shown. The labor rate for replacing defective parts will be at 100% of the current posted show rates at the place of repair. Prior to any work done, you must contact Harvest by Meridian for any labor subject to warranty; this must be authorized by Harvest by Meridian.